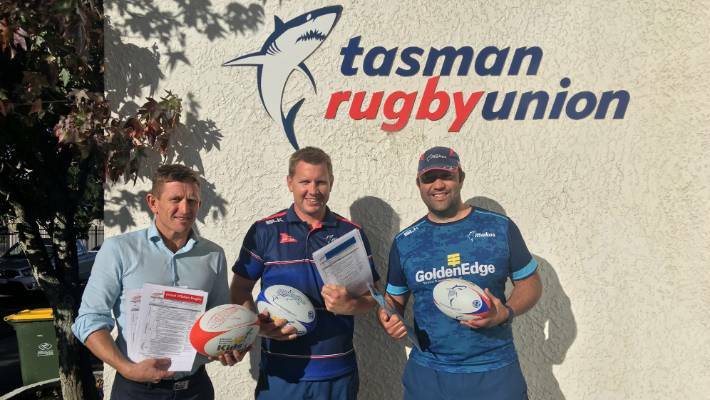 Tasman Rugby Union board member Scott Gibbons, rugby development officer Mark Cochrane and community rugby manager Kahu Marfell with some of the coaching resources designed to upskill local mentors. 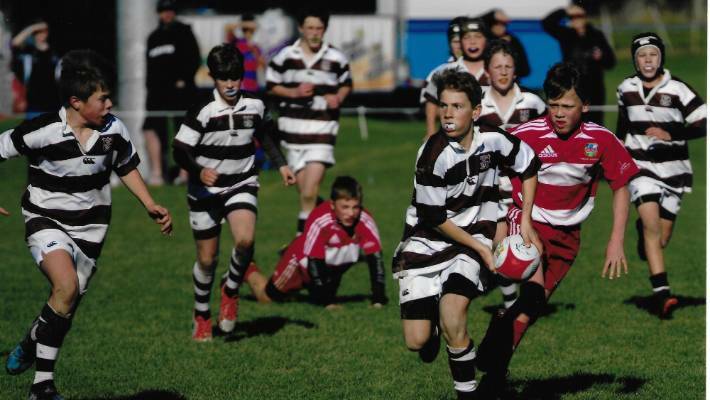 They've written the book(let) on upskilling coaching resources, Tasman Rugby Union are now using video to better enable the region's junior mentors to read the game. The union's first batch of e-coaching videos were uploaded last week through the Mako Rugby YouTube channel. The video roll-out follows on from a series of booklets produced last year, based on the Mako 5 skills of catching and passing off both hands, breakdown, decision making or games sense, tackling and body position in contact. John Brown of the Motueka-Golden Bay Under 52Kg rugby team prepares to pass in a game against West Coast. Tasman Rugby Union hopes to continue upskilling coaches and junior players through a series of video resources released last week. TRU chief executive Tony Lewis said while the ITM-sponsored booklets proved popular, providing a visual method of learning that many people found engaging prompted them to think outside the box. The E-Coaching videos were filmed in January and February this year and featured current and future mens and womens Mako players. As with the booklets, the drills were broken down into team and individual skills for the Mini Mako (Under 6-Under 7), Hammerhead (Under 8 - Under 10) and Great Whites (under 11-13) age groups. Cochrane said the emphasis was on a "teaching for understanding" approach, practicing skills within a game scenario. "It's more fun and we can teach it in an unstructured way so they can make those free-flowing decisions." Cochrane said the value of the videos was not limited to junior players, with the resources useful for senior coaches looking for a handy warm-up drill. "Use of technology was definitely increasing, so the ability to teach and being able to use video and provide that instant feedback is becoming a big part of the game now as technology advances and the availability of it as well." "The fact that coaches can see the written template of what they can deliver and say 'how does that game go', look up the video and visualise how it's supposed to go and show it to the kids or post to the team Facebook page."